I'll have to write a post about my historical performance sometime in the near future. I'm sure you will all like to know what the heck I was doing in 2011. 14.6% since 2011. Better to have been in an index fund? Brokerage (Taxable) Account. "Detail+" = shares bought (second column) & sold (third column) in varying amounts on different dates. I ran out of free trades early in December of this year. The counter resets at the end of the month. This lesson is about making sure you arrange your affairs so that you don't sell your shares forcibly at someone else's price. That's what happened to me. I bought shares of Ford (F) early in 2014 despite having a plan to purchase my third rental property sometime in April. The deal ultimately fell through due to a low appraisal, see: Appraisals-matter. I thought: I have enough time to make more money. I'll buy these Ford stock shares here and sell them at the next opportunity (once I was in the green at least 3%). That opportunity never materialized. I held onto the shares all the way until the Loan Officer called to tell me: "It's time to liquidate...the Underwriter will want to see your checking account have the necessary funds to make the down payment and closing costs." 2. Real Estate Investing and Stock Market Investing Don't Mix! Loan Officers can't guarantee that the Underwriter will approve your loan application for full funding. Loan Officers can't guarantee that the independent appraisal will come in at or near the sales price to make the deal work. Don't you just hate that? I strongly recommend that if you intend on using stock to fund a real estate deal, that you liquidate shares and place the cash in a Money Market account until the deal closes or fails to close. Why? So you're not like me and get tempted to make one last "investment." If the RE deal falls apart then you have a decision to make: Try another lead/deal or let it be, placing the cash back in your taxable account for trading purposes again. *I did indeed find another deal, but not before the first one cost me $886 and two months of dead time in the market. I purchased my third rental in June, using $25K for the down payment and closing costs. This left my Brokerage account with less that $5K to work with for the remainder of 2014. I only "realized" $445 in profits and my year to date (YTD) return is 7.5%, well below the S & P's return thus far, 12%. I do, however, have other winners in my portfolio currently that I could sell, and I would too if I were a fund manager. Then I could pad my results. Thankfully, I have better sense and ethics. Investing in a tax free retirement account: See: A-comparison-of-retirement-accounts for more info on retirement accounts. Retirement Account (Roth IRA). I also get 100 free trades with this account and have yet to use them all. Some people buy tangible RE in their self-directed IRA, but this is a more intricate process with must heed tax restrictions. I had the makings of a solid decision with Target (TGT), buying the shares right after their worst time in history as a publicly traded company: The Target data breach of Thanksgiving 2013. Here you have a clear example of a panic job. I knew the shares would rebound and that the company would not go bust, but I let the talking heads discourage my ownership of the shares. Do you remember all that talk of Target having seriously injured its relationship with customers whose information was stolen? It went on and on. And of course the stock price fell further. Instead of sticking with my conviction of the shares coming back inevitably, and buying more of them, I panicked and sold low. How are the shares doing today? First, they hit a low of $54.66 on 2/5/14, less then fifteen days after I sold. I must have felt vindicated (limiting my losses) at the time. Mr. Market made a fool out of me though. The bull continued to charge and now the stock is at $73.69! I admit, I was spooked. I thought: Maybe there is no recovering from this data breach. These guys on television keep saying TGT is losing its customer base and new customers are too scared to shop there. Lessons to be learned: 3) Don't listen to the talking heads. 4) Unless a company is burning cash and can't cover its debt any longer, don't give up on a great company that gets mis-priced as a result of a fixable mistake versus a core business one. What should I have done? Bought more shares of course, all the way down to its low in early February. *My YTD return for my Roth IRA is only 5.3%, and my net profits as you can see above, were only $1,299. Below are my historical returns. Yeah, 2011 was interesting. 16.8% since 2011. Better to have been in an index fund? 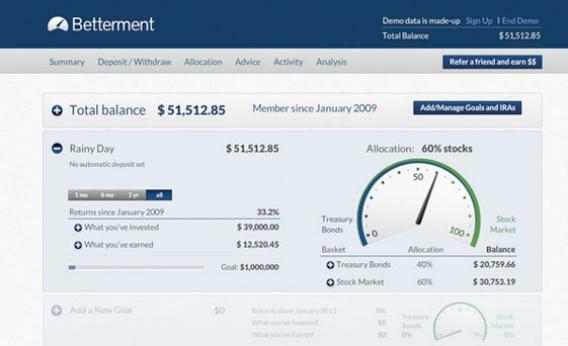 Automate Your Investing with Betterment!